The long-lived Pallas-Pluto trine/parallel has bought us yet more violence. Here's how the Bloodbath Formula appears in the start this weekend's mall shooting in Maryland. It's very similar to the configuration for the recent violence in Africa. 1. Pallas trine/parallel Pluto: power overcomes ethics. 2. Venus septile Neptune: value liquefied. 3. Venus conjunct Pluto: value destroyed. 5. 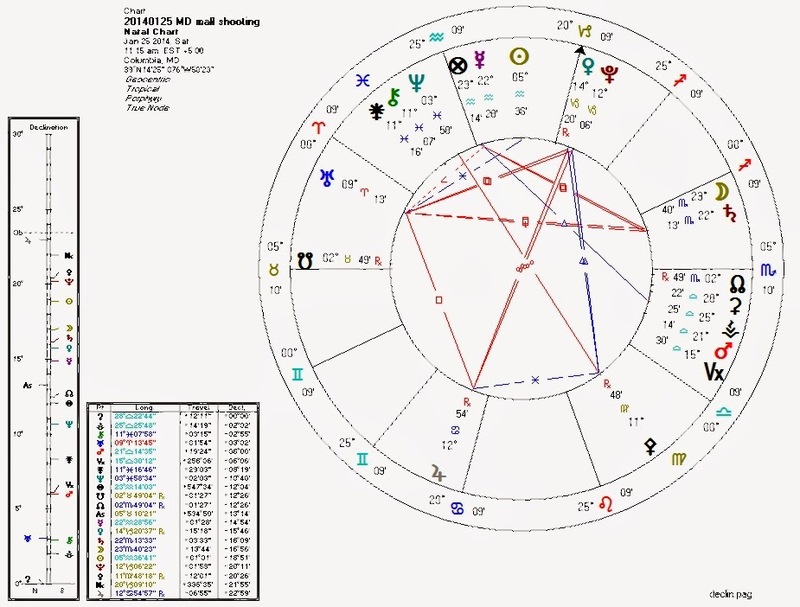 Pluto septile Saturn (ruler of Sun and Venus): destruction again. 6. (optional) Mercury conjunct Part of Fortune in the Tenth House. Prominent Mercury. The Venus station this month is very close to Pluto, and Venus will be in orb of Neptune for much of that time. We may see even more incidents while these factors are in play and Pallas is still in range of Pluto. January 29, 2014 at 10:50 AM http://www.nydailynews.com/blogs/theshack/2014/01/man-kills-women-with-a-hammer-believed-they-were-witches The same configuration, minus Mercury.